Hollywood loves sequels. They love it. They’re a little too in love though. If Hollywood wants to continue banking off of franchise-worthy films, they should consider spin-offs over sequels. “Get Him to the Greek” shows that perhaps individual characters, and not entire plots, were meant to be seen again. “Get Him to the Greek” uses the 2008 instant classic “Forgetting Sarah Marshall” as its starting point. 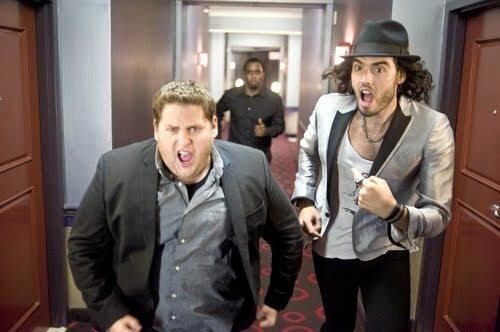 It pulls away Aldous Snow (Russell Brand), the self-absorbed English rocker. Snow still exists in the same universe as “Sarah Marshall.” After the success of such songs as “Do Something” and “Inside of You,” his career was almost totally destroyed after the failure of the accidentally offensive “African Child.” And don’t worry, you will get your music video. Snow also got married and divorced. After seven years of being sober, he took up drinking and drugs once again. Across the pond and an entire land mass over, Aaron Green (Jonah Hill) is a rising executive at a record label with a doctor girlfriend (Elisabeth Moss) that he rarely has time to share a moment with. Green is what Hill’s character in “Sarah Marshall” (who is totally different) would have become if Snow actually ever listened to his demo. But the music business is changing. Green’s boss Sergio (Sean ‘P. Diddy’ Combs), who is always mad about something, wants a game changer. Green suggests the winning idea: bringing back Snow to do a show at the Greek Theater in Los Angeles. The only catch is, Green has to get him himself and bring him from London to New York to Los Angeles in just 72 hours. Basically, it’s a good set-up that makes room for even better jokes. The humor of “Get Him to the Greek” stems from a mixture of awkwardness and over-the-top gags. Sometimes, these two styles interact with one another. The awkwardness works because the actors play the characters that way, and the slapstick works because it’s well directed. Yet, the one comedic aspect of “Get Him to the Greek” that could be considered close to brilliant is its satire of the music world and entertainment industry in general. Snow’s songs are always laced with innuendos. At another moment, Sergio plays the music he thinks will sell right now. It’s basically just a string of curse words, but it sounds nearly identical to modern mainstream rap. Satire is at its best when it seems too ridiculous to be true, but too truthful to be just a joke. Like most of the other films in the Apatow oeuvre (Judd produced this), there is a strong reliance on the actors. And the actors deliver. This is Hill’s first true lead performance (in “Superbad” I’d say it was a co-leading performance), and with it he proves that he’s more than just the creepy guy in the background who does cringe-worthy things. What this kind of comedy needs to work (besides good jokes) is relatable characters. Green’s uptight nature feels genuine and not forced. Hill works to make him not only likable, but also hatable. He’s nice when he should be, and extremely selfish when he should be. Moss is essentially playing Peggy from “Mad Men” yet she adds a dash of humor to it which makes it very effective. So Hill may be a great leading man, but there are two absolute scene stealers here. I thought from the time I first saw “Sarah Marshall” that Aldous Snow was a character worthy of his own movie, and he finally got it. He is transformed from ex-druggy musician to a character worthy of being in “Spinal Tap.” Some might call Brand’s performance effortless, because he is essentially playing himself. However, I enjoy performances like that because what it really means is that no other actor could play this character. It belongs distinctly to someone. Brand makes the character real by adding little distinct features to him such as a pretentious way of pronouncing words and an even more pretentious walk. While his character is a huge jerk most of the time, there are little moments that make him seem relatable. Making a caricature relatable is what should be defined as fine acting. I agree with many who are saying that Diddy’s Sergio deserves a movie of his own. His character is too big, bloated, and hilarious for one film. Diddy channels the angry boss role flawlessly. His performance reminded me of a variation of Malcolm Tucker from “In the Loop” with less of a good reason for being so angry all of the time. “Get Him to the Greek” is written and directed by Nicholas Stoller. Like he also displayed in “Forgetting Sarah Marshall,” Stoller has this amazingly rare talent of creating a huge ensemble full of three dimensional characters. While some of the backstories in “Greek” certainly don’t feel as original as the ones in “Sarah Marshall,” they no less bring understanding to the characters. And why, do you ask, is backstory so important in a comedy? Because it’s easier to laugh with people you like than people you despise. Green could’ve been nothing more than a selfish, cold businessman. Snow could’ve been nothing more than a self-absorbed and emotionless rock star. Yet, “Greek” is better than that. It doesn’t need to stoop down to that level. “Get Him to the Greek” lacks some of the finer points of its predecessor, yet I find few things here I could really complain about. In a summer season that has so far been pretty tepid, “Greek” seems less interested in trying to sell something to you and more interested in actually trying to give you a good time at the movies. At that I say, it nobly succeeds. This entry was posted in British, Comedy, Forgetting Sarah Marshall, Get Him to the Greek, Jonah Hill, Judd Apatow, Movie Review, Russell Brand, Satire on June 5, 2010 by ian0592. “Get Him to the Greek”‘s REAL predecessor is “My Favorite Year” from 1982. Mark Linn Baker had the Jonah Hill role and Peter O’Toole had the Russell Brand star part. Worth finding as it was very funny. Excellent views.This is Brand’s film, and every aspect of his persona is played to the max – the sexual magnetism, the multiple addictions, the doting but distant mum, the hangers-on and women who want to control him.